Does the Transit Pro require any drivers? Is the Transit pro supported for use on iOS? How do I change the playback sample rate? How can I connect this to my speakers? Where can I get music in the DSD format and how can I play it? Why can't I play DSD files over the digital output? On Windows, your playback sample rate, bit rate, and buffer size can be adjusted from the Transit Pro Audio Control Panel that will be installed along with the driver. This will be found in your programs folder or in your taskbar. For best results, choose your sample rate before opening your software for playback. 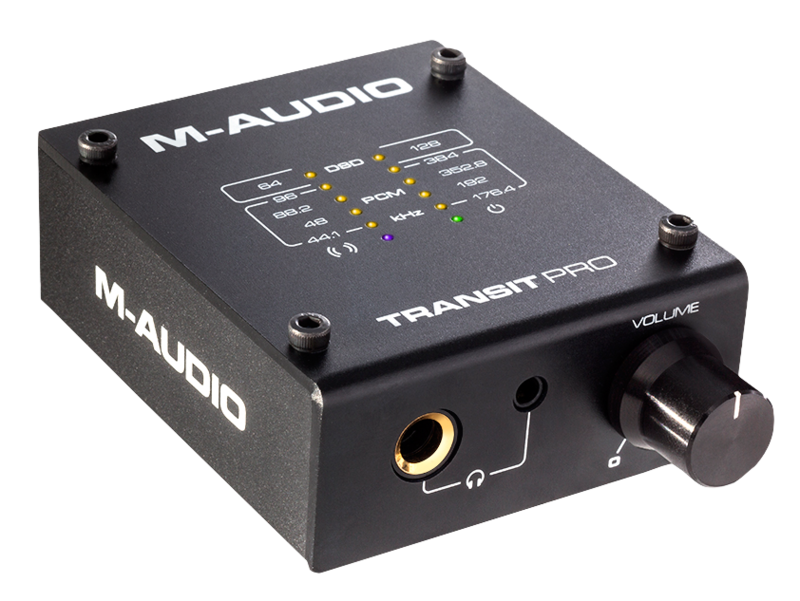 The Transit Pro features a single 1/8" (3.5mm) output that doubles as both an analog and digital (S/PDIF) output. For analog output, use the included 1/8" TRS to stereo RCA cable to connect the output directly to RCA line inputs on a pair of active speakers or to a stereo line input on your receiver. For digital output, use the included mini-toslink to toslink cable to connect to a digital optical input on your receiver or speaker system. Please note that this output uses the S/PDIF protocol and will not be compatible with ADAT inputs and outputs that use a similar optical cable. DSD, or Direct Stream Digital is a format of high-resolution digital audio that somewhat rivals the standard PCM format, most commonly used by WAV files. PCM, or Pulse Code Modulation, uses a combination of bit and sample rates to determine and recreate the amplitude and frequency of a waveform to create a digital version. The higher the bit rate, the better dynamic representation and the higher the sample rate, the better the resolution. DSD on the other hand only uses a single stream of bits, but at a much higher sample rate than PCM, starting at about 64 times the standard sample rate of a CD (44.1kHz) and jumping up 128 times or even higher. 64x and 128x may otherwise be known as 1x and 2x respectively, referring to multiplied values of the original 64x. This process of single bits and fast sampling rates would use the density of "on" bits and "off" bits to determine the digital structure of the sound. Because DSD is such a different approach to digital audio, it requires a different approach to it's conversion and playback, thus requiring DSD specific converters and interfaces. This is where the Transit Pro comes in to provide both PCM and DSD support in one simple package. As a DSD converter the Transit Pro will support both 64x (1x) or 128x (2x) playback. DSD-Guide.com - Where Can You Find DSD Music Downloads? Current digital playback and cabling formats, such as the Toslink output found on the Transit Pro, are all based around the standard PCM playback and sampling rates. These channels have limits to the amount of data they can carry and cannot handle the extreme rates of DSD. For this reason, the Transit Pro will not send DSD playback out through the digital output.